This is an interesting (and delicious) variation of the normal tiramiù, with coffee replaced by strawberry puree. The recipe for the mascarpone mixture, unlike most British and American ones, doesn’t use whipped cream, producing a much better final result. Note that tiramisù contains raw eggs, so you should use very fresh eggs. Quickly wash 500g of strawberries under running cold water and hull them. Cut the strawberries in half and put in a bowl with 60g of sugar and the lemon juice. If you have time, set aside the strawberries for about one hour. Put the strawberries and the juice they released in a blender and blend until you get a liquid puree. If you don’t like the tiny strawberry seeds, you can strain the puree through a fine sieve. Whisk the yolks with the remaining sugar until the mixture is fluffy. Add the mascarpone and mix well. In another bowl, whip the egg whites until stiff peaks form. Delicately fold the whipped whites in the mascarpone mixture. For normal tiramisù I prefer whole savoiardi biscuits, but, in this case, they don’t soak the puree as well as coffee, so I prefer to cut them in half lengthwise. If you are in a hurry, you can skip this step. Soak a few savoiardi at a time in the strawberry puree and arrange them in a serving dish (I usually use a 35×23 cm Pyrex dish). You should use about half of your biscuits for the first layer. Spread half of the mascarpone mixture over the savodiardi. Repeat with another layer of soaked biscuits and one of mascarpone mixture. Wash and hull the remaining strawberries. 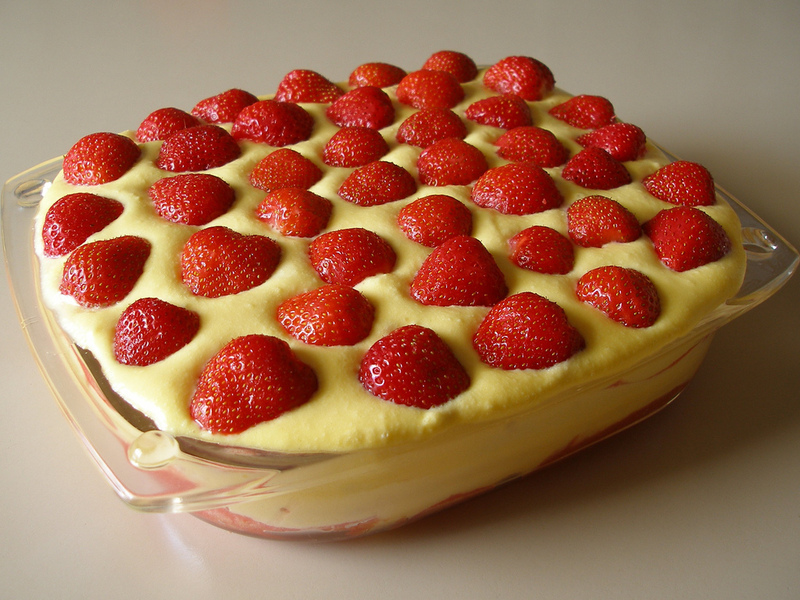 Cut the strawberries lengthwise and decorate the tiramisù with them. This entry was posted in desserts and tagged ladyfingers, mascarpone, savoiardi, strawberries, tiramisù by Marco Barisione. Bookmark the permalink.